Today, people are living longer and fuller lives more than ever before. And while that is good news, the reality is that there often comes a time when older adults can no longer manage their personal business and finances. When seniors cannot handle daily finances or become more susceptible to financial mistakes, the consequences can be severe—those who forget to pay bills can lose their home to foreclosure, get evicted from an apartment, risk utility shut-off, or destroy their credit. They can also fall victim to scams and get cheated out of large amounts of money. So how can family members help when an aging parent or loved one begins to struggle? Ideally, the best time to address this issue is before your parent or relative needs any help at all. Talk with your loved one about what will happen if and when they need help managing finances, and agree on some key events that might indicate that it is time for someone else to step in. Then come up with a plan as to how you will work together if and when that time comes. If there is not already a plan in place, you’ll want to determine if your loved one currently needs help, and if they do, how much help is needed. If they do not want to have an open conversation about it, you can do some investigating. Take a look around your loved one’s home. Do you see lots of unopened mail, bills scattered around, or piles of papers? Can they show you a filing system or describe how they manage their money? Do they know what bank accounts and investments they have? If you can, go through their checkbook, credit card statements, and bank statements. Look for anything unusual, including: double entries for the same item, odd transfers, or payments to questionable places. Do you see consistent entries for the mortgage, rent, and utilities in the checkbook or bank statement? Have they received letters from collection agencies? Have they been the victim of a telemarketing fraud, investment fraud, identity theft, or predatory lending? Is it clear that matters are in a disarray, yet they insist that they are taking care of things properly? It is important to be sensitive when starting a conversation about the state of a person’s financial affairs. Remember that your loved one could be embarrassed that they are no longer able to look after things the way they used to, or afraid that by releasing control of their money they are losing their independence. These conversations can be difficult and emotional, but putting in the effort will make the situation more manageable if assistance is ever needed. Involve your parent or relative in the decision-making process as much as possible. Explain your concerns and point out possible consequences if financial management is not done properly (such as foreclosure, closed accounts, or damaged credit). Work together on putting a plan together for the future. Managing personal finances, or making decisions on behalf of a loved one, can be challenging and can lead to great stress. In some cases, it can be a full-time job! This is when having a Professional Fiduciary step in can be especially important. Keep in mind that sufficient legal documents need to be in place in order for this to happen. This is where estate planning is key. A Fiduciary is a licensed individual who is entrusted authority on behalf of another person and is bound by fiduciary duty to act for that person’s benefit. If a Fiduciary is named as Power of Attorney or Trustee, they can in essence “step into the shoes” of the client to make the decisions that the client would have made, to the best of their knowledge. If not so named, a Fiduciary can still be of great assistance in managing the many details in order for the client or family member to make decisions. 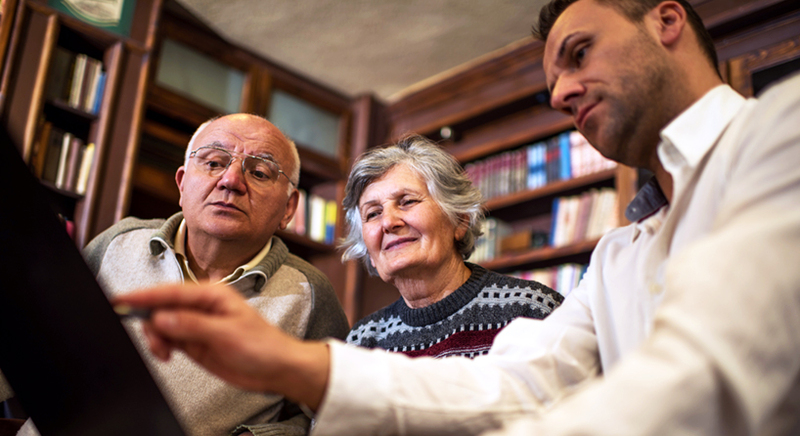 With the largest team of licensed Fiduciaries in California, Seniors At Home’s Fiduciary Services team helps seniors, adults with disabilities, and their families to manage their financial responsibilities accurately and on time. Seniors At Home’s Fiduciaries and Care Managers work with other professionals (accountants, financial advisors, tax preparers, realtors, doctors, etc.) to help seniors and their families manage their responsibilities and—most importantly—plan for the future. To learn more about our many services, including our Fiduciary Services, Advance Care Planning, Futures Program, or how to prepare for retirement, call our free information line at 844-222-3212 or click here to contact us.